When my daughter turned five in the year 2000 she loved Disney's Little Mermaid. Her whole toy inventory was of something Mermaid. When we had her party, we decided to focus on Mermaid/princesses. The party included my daughter and 5 other little girls. For decorations I had purchased a paper tablecloth, cups, plates, and napkins with the Mermaid on them. I actually made her a cake--there was a wonderful cake in the magazine Family Fun that year of a treasure chest. The children arrived, I let them play for 15/20 minutes then we did a craft. The craft was followed by a reading of the Little Mermaid. After the reading, a "pirate" showed up and we had a treasure hunt outside. Following the treasure hunt we sang and had cake and ice cream. We followed with present opening and then good byes. It went really well. 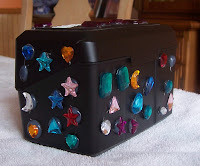 The craft we had for the party was jewel boxes. I had gone to Staples and purchased some boxes one would use to hold index cards, they were all black. The I got bags of plastic jewels and letter stickers from the local craft store. Each girl was given a box and the letters to spell her name. The children put their names on the boxes, then we decorated them with the jewels. I used hot glue from a glue gun to hold the jewels to the box. This is where it is great to have other parents around for help. When finished we went to the other room to have the Mermaid story. Then our "pirate" showed up. I did not hire a pirate. My husband dressed in some Halloween costume material and had an eye patch and bandanna. He brought with him a special treasure map that everyone followed, under the pirate's lead, to find treasures. Before the girls had arrived, I had gone outside and placed all the treasures. I had bought wands, crowns, necklaces, and rings from our local Dollar store. The wands were stuck in the ground under a tree, the crowns were in a bush, and the rings and necklaces were somewhere else in the yard--sorry I don't remember exactly where. The pirate took them to each place and they got their treasure. These items were their "party bag" items. The kids loved this! Then we went back in, had our cake and ice cream, opened presents, and we were done. We had a wonderful party, and believe it or not my daughter questioned who the pirate was for a couple years after that.